SXSW is a grueling experience. Bands play multiple shows a day at different venues, routinely starting early in the day and running well into the next morning, with fans rushing all over Austin attempting to make the most of the festivities. But as much of a slog as it can be, it’s still a place where magical things can happen. With this, a deal had been struck, and though short videos of the performance littered social media yesterday, Pitchfork has now uploaded a full video of Buress’ foray into indie-rock. 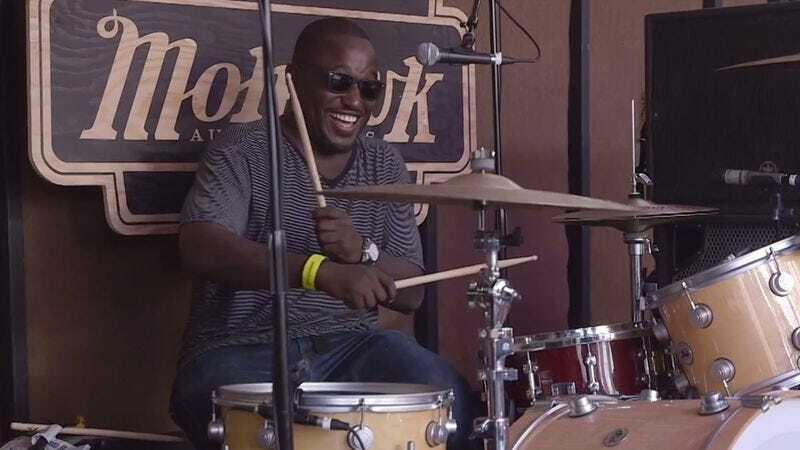 Even though Buress wasn’t underselling his lack of skills, there’s a joy that runs throughout the song, with a toothy grin or hearty chuckle following nearly every one of his drum hits. The band takes it all in good fun, with Dupuis beaming throughout the song, even as the track devolves into the kind of racket one would expect from a teenage garage band. Later that night Buress appeared on an episode of Jimmy Kimmel Live, and when asked about the band he played with blanked on the name. It’s something he chalks up to being “out in the street getting drunk,” as is customary at SXSW.